ATHENS --- The University of Georgia and Clemson University will renew a rivalry that dates back to 1897 when the two teams meet in a home-and-home series in 2013 and 2014. The contract agreement was announced by UGA Director of Athletics Damon Evans who also said the Bulldogs would open the 2006 season against Western Kentucky University in Athens on Saturday, Sept. 2. Georgia's original '06 opening day opponent, Central Florida, had to cancel the game due to new conference scheduling. "Georgia and Clemson is one of the oldest rivalries in the country," said Evans who also indicated that exact dates for the games have not been determined. "It's a natural fit and one that we are delighted has worked out in a way that suits the schedules of both schools. Some of the greatest college football games have been played between Georgia and Clemson over the years, especially in the 1980's, and we think this will be very well received by both Georgia and Clemson fans." Western Kentucky won the 2002 Division 1-AA national championship and is currently ranked number one nationally in Division 1-AA. Evans also said the game with Western Kentucky "will give our fans a chance to see a team that has never visited Sanford Stadium and a school that we are currently playing in a basketball series." 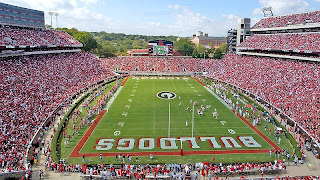 While dates have not been determined, Georgia will travel to Clemson in 2013 and the Tigers will play in Athens in 2014. Georgia leads the overall series with Clemson, 41-17, and has won the previous five meetings dating back to 1991. However, from 1978 to 1990, the Bulldogs and Tigers played 11 games with equal records of 5-5-1. The short version is: I'm all for it.